So if Catoe has his way with the budget, say goodbye to 8-car trains. And the peak period turnbacks at Grosvenor. And look for more crowded trains and buses. Catoe unveiled his plan this afternoon to deal with the (now) $40M budget gap in Metro’s books. Bus and rail service reductions, including lengthening the time between trains and buses. Gaps could increase by a minute during rush hour to upwards of 10 minutes over the weekend. Such service reductions would save the transit agency an estimated $4M. 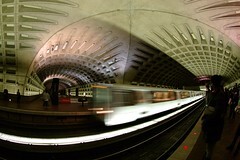 The timetable for such cuts could be as early as February of next year through at least June, when Metro’s fiscal year ends. But keep in mind that Catoe & Co. have indicated that next year’s shortfall is now around $175M, so it’s quite likely such cuts – if approved – will become “permanent” for the foreseeable future.